Largehearted Boy: Book Notes - Alex Segura "Down the Darkest Street"
Book Notes - Alex Segura "Down the Darkest Street"
Alex Segura's new novel Down the Darkest Street is a gritty and compelling follow-up to his debut Silent City. "Segura (has) an edgy storytelling style, snappy dialogue, and a cast of salty characters." Second novels are a lot like sophomore albums. After pulling out all the stops for the first - in the case of bands, touring, writing songs and recording - you're instantly expected to create a second work, minus the years to build up to it. It poses an interesting and daunting creative challenge. Not everyone survives it, band or writer. I spent years writing and revising the debut Pete Fernandez mystery, Silent City. It was an exhausting, exhilarating, and intense learning experience, and by the time I was done, I felt as if I'd poured my insides onto the printed page. Even then, I knew the sequel had to do more. Sequels, for me, work when they're denser, darker, and more personal than the original work. 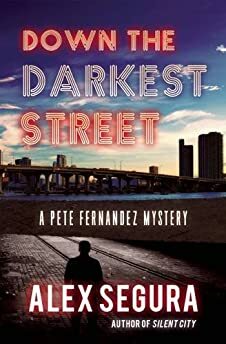 While Silent City introduced us to Miami protagonist Pete Fernandez and his myriad problems, I wanted the sequel to double down on the dangers - to show that things like alcoholism and failed relationships don't just disappear because the bad guy has been vanquished. In Down the Darkest Street, as Pete and his partner face off against a deadly killer, Pete must also look at himself in the mirror and try to figure out what to do with the battered life that he is left with after Silent City. The music I listened to while working on this book was also moody and personal. Here are some songs that I found myself listening to again and again definitely while the book was born in my head, as I fleshed out its characters and the challenges I was going to put Pete through this time. Costello's working class ballad broods from its opening, jagged piano chords to the somber sax solo that closes his melancholy ode to shipyard workers. The song evokes a meandering, foggy feeling - like sleeping in but still coming to with a lingering hangover. Something Pete experiences more often than not in the early stages of Down the Darkest Street. The idea of rebirth and rising from the water flows throughout this song, starting with the title and past the St. Vincent-sung "Hey, hey, Lazarus" refrain. Thumping, funky, with a tinge of menace, yet remarkably heartfelt, the tune shimmies and dips unpredictably, optimistic, but also very afraid, hesitant, but hopeful. Down the Darkest Street is about facing your past and battling the demons that linger there - and if you listen to this song with that in mind, you can probably tell why it stood out to me. It even makes a notable appearance early on in the novel. The music is haunting, sparse, and almost nihilistic--Nilsson sings as if he were perched on a barstool, his whiskey-coated voice longing for a past that might never have been. The bottom-heavy, throaty, and simplistic title track from Beat Happening's fifth album has the right mix of lusty and dangerous, but it's the repeated "turn me on, dead man" chorus that ups the sense of foreboding, making it a perfect mood-setter for a book about a serial killer and his lo-fi, private-eye nemesis. Gillian Welch could sing along to craigslist ads and I'd listen, but she doesn't -- she sings plaintive, bare songs like this one. The kind that stick with you for days. At times defeated, at times uplifting, the song grows older with each listen, its narrator a world-weary messenger struggling to take another step. An unfiltered, harsh and defiant breakup song that builds to an unexpectedly harsh (but fulfilling) crescendo, Wainwright's "B.M.F.A." (listen to figure out the acronym) doesn't mince words. The desperate, angry and despondent vocals pair perfectly with Wainwright's guitar and a sparse accompaniment to create the kind of song you play for someone you never plan to see again, or want to. You find a special kind of darkness and despair at the bottom of a glass in an empty bar, and a special kind of crowd that gathers around you near closing time. Isbell captures that muted, resigned feeling with this heart wrenching ballad, telling a tale of two lives crashing into their respective bottoms, but falling side-by-side for a short time. A song thick with sadness and hopelessness that you can't help but wallow in, too.